After a 19-point, blowout loss to Georgia Tech Feb. 22, the Miami Hurricanes’ defense looked revitalized against Virginia Tech from the opening tip of their regular season finale. Miami scored 23 points off 20 Virginia Tech turnovers and controlled the lead for nearly the entire contest, defeating the Hokies 76-46 on Senior Day Feb. 25 at the Watsco Center. Led by 17 points, a career-high eight rebounds and six assists from freshman Kelsey Marshall and 13 points from redshirt senior Shaneese Bailey, Miami started off dominant on the offensive end and never looked back. But regardless of the score, Feb. 25 was about those at UM who will be leaving the program after the season: seniors Shaneese Bailey, Erykah Davenport, Keyanna Harris and Neydja Petithomme. The Hurricanes (20-9, 10-6 ACC) defeated the Hokies (17-12, 6-10 ACC) for the 14th consecutive time and have now reached the 20-win mark for the eighth time in nine seasons. Chanette Hicks, one of Virginia Tech’s top defensive players, was injured and unable to play against Miami. 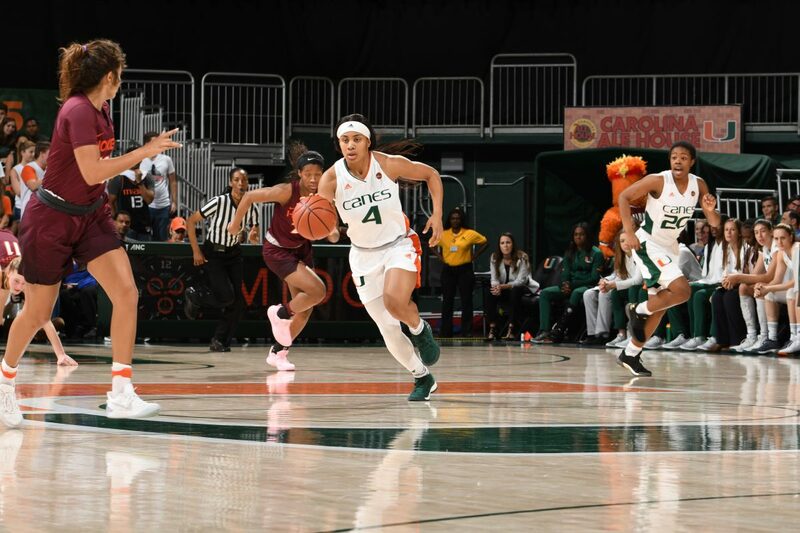 Marshall said this made an impact on her performance and her team’s efficiency compared to the Canes’ last outing against the Hokies, which resulted in an 82-78 UM road win Jan. 28. Guard Rachel Camp totaled 13 points and seven rebounds to lead V Tech as the only player on her team to score in double figures. The Hokies shot just 30 percent from the field. The Canes have earned a No. 6 seed in the upcoming ACC Tournament, which will span from Feb. 28 to March 4, and have a first-round bye. They will play the winner of the matchup between No. 11 seed Wake Forest and No. 14 seed Pittsburgh at 8 p.m. March 1 in Greensboro, North Carolina. On the status of Bailey’s injury, she said her leg is in good condition, and she is ready for more games ahead. The Hurricanes began to pull away toward the end of the second quarter, when they went on an 8-0 run to make the score 31-21 to close the first half. Nine out of 10 Hurricanes scored at least one basket.